Organisers of the first World Buttery Championship have selected 10 bakers to compete for the title in Aberdeen today. From 9am to noon, the entrants will rustle up traditional versions of the famous snack in professional kitchens at North East Scotland College. Four working bakers will take part, representing shops in Aberdeen, Banff, Inverurie and Ballater. Retired bakers and cooks, from New Pitsligo, Cullen, Dundee and Balmedie will don their aprons once again in the hopes of winning the specially made granite trophy. And two amateur bakers, Jacqui Cameron from Aberdeen and Coleen Reid from Aberchirder, will also put their skills to the test. The event has been organised by the Slow Food Aberdeen and Shire organisation to highlight traditional methods of making the snack, which members fear are at risk of being forgotten. 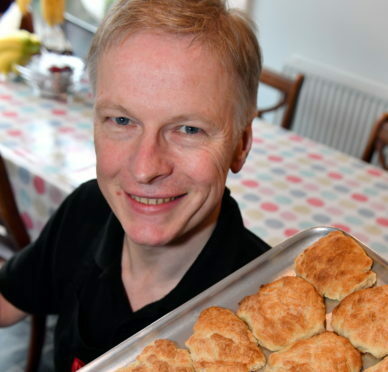 Co-ordinator Martin Gillespie, who will act as a judge, said: “It will be a fun day, and I think it would be great if the amateurs do well as it will encourage more people to try making their own rowies at home. Slow Food say that the version of the flaky snack now most commonly eaten represents a radical departure from those scoffed at sea generations ago. In many cases, the commercial production of butteries has led to the original ingredients of butter and lard being replaced with margarine and palm oil.